Sometimes the most beautiful things are the deadliest ones. In nature, you should learn to accept that fact, since some of the deadliest creatures living in the wild show up with the highest beauty standard to us. Poison dart frog, with the neon-green color, is one example of the deadliest yet prettiest animals in the world. 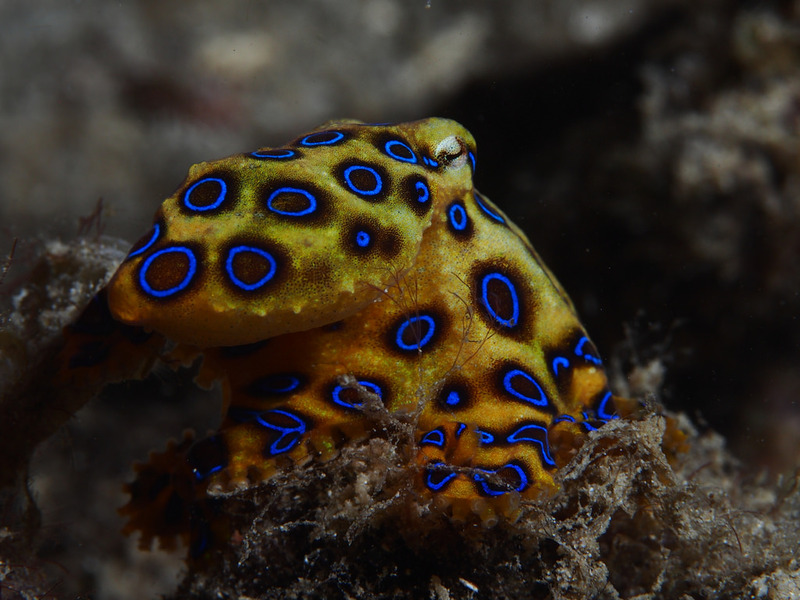 While in the ocean, the title is held by blue-ringed octopus, with its vivid color and deadly poison. At first glance, you might want to touch it, take picture with it, and maybe kiss it. But you might have to hold that thought, because if you have complete sense you will just want to avoid running into one. Here we will try to take you as close as possible to this beaut without risking your life. 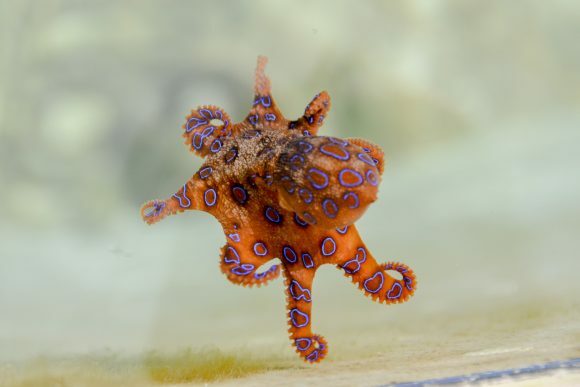 Pastel color as its base, patterned with vivid blue rings all over its body, makes blue-ringed octopus look like a pretty moving coral. Its tiny size adds up the innocent appearance to this creature. But don’t let its appearance fool you. The vivid blue rings are actually a sign of danger for you that you should learn from first encounter. 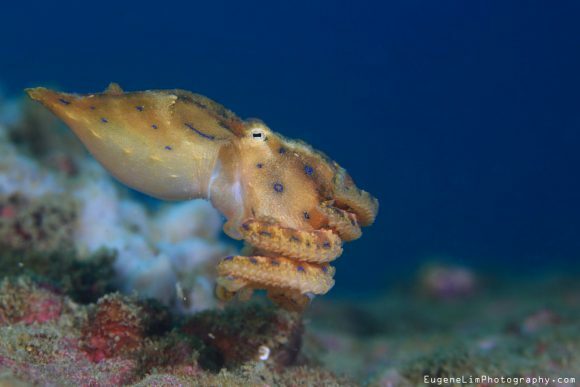 Just like any other species of octopus, this creature actually don’t like to show up and prefer to just camouflage themselves with their environment. Thus, when they are not hunting for foods or planning to mate, the sea creature hides its vivid blue rings. In this phase, those rings will appear as pale blue instead. So, when will it show up its vivid blue marks? The vivid blue rings will show up when the octopus is facing intense situations, like hunting for foods, looking for mates, or facing dangers. The blue rings are their way to tell enemies to stay away from them. “Like most animals, they will only attack a human if they feel like their lives are in danger. It is always out of self-defense rather than aggression,” said oceanographer Jenny Hofmeister to National Geographic. So, whenever you see those blue rings, the only choice you should make is to stay away from it as far as possible. The creature might see you as an enemy that should be killed with their main weapon: deadly venom. You might ask how dangerous is this creature that we warned you to stay away from this creature for many times. For your information, it is extremely deadly for human because just one bite from this animal can kill you in just minutes. The initial bite is too tiny and painless for human, making the victims unaware that they have been bitten in the first place. 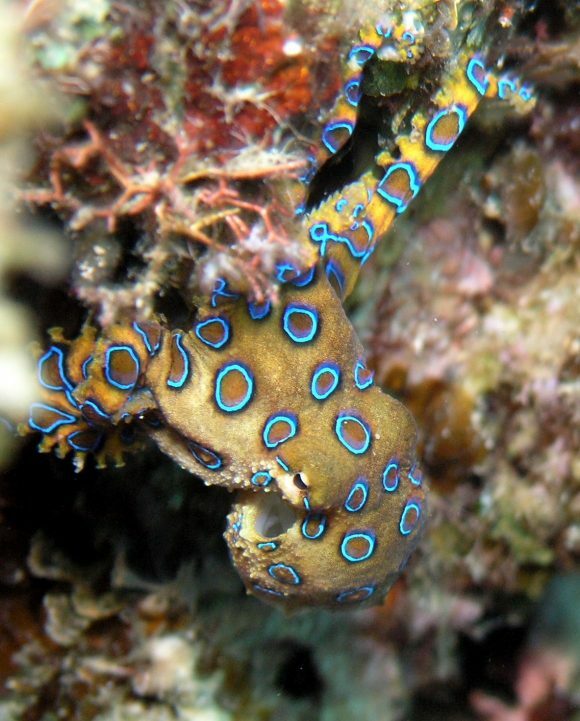 During the bite, blue-ringed octopus transports a small amount of venom containing tetrodotoxin, histamine, tryptamine, octopamine, and dopamine. Within a few minutes, the venom will take its effects and bring the victim closer to death. Immediate medical treatment is needed as soon as the victim gets bitten. 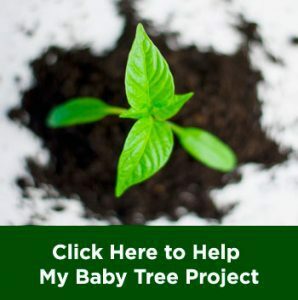 Since most victims are unaware that they have been bitten, the treatments usually comes too late. 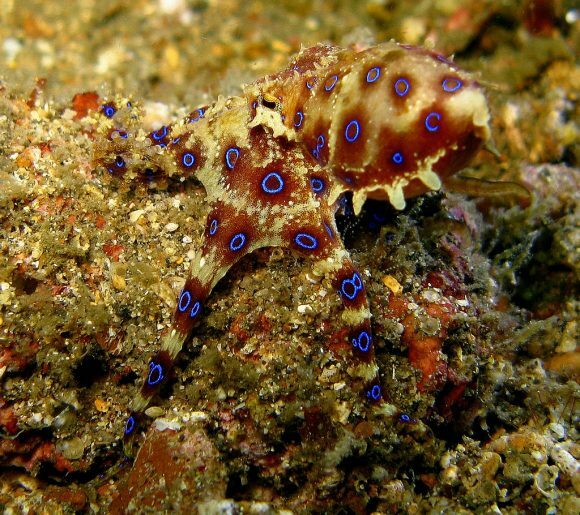 This is the reason why blue-ringed octopus is considered as one of the deadliest creature. 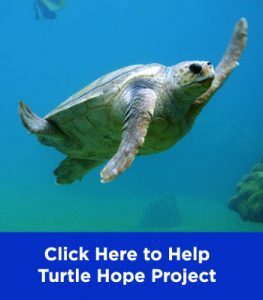 Not only because most victims are unaware of the bites, but also because the locations where this animal can be found are usually too far from medical facilities. Because this animal can be found in shallow waters near beaches, most of the victims of this animal are divers and beach visitors. The beauty of this animal, in its attacking state, shall attract those people and make them wanting to touch it. “Most bites come from people collecting what they think is an empty shell, put it in their pocket, and the octopus hiding in the shell comes out. 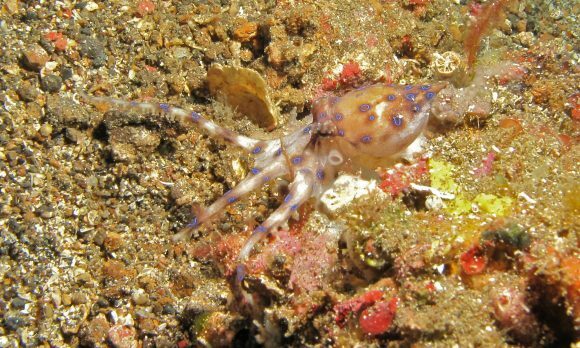 This is why it is not recommended to shell-collect in areas where blue ring octopuses occur,” said Hofmeister. The venom of blue-ringed octopus contains tetrodotoxin which is produced by bacteria inside the creature’s salivary gland. Tetrodotoxin is one of the deadliest neurotoxins on earth because this toxin can cause total paralysis and blindness within minutes. This neurotoxin can also be found in pufferfish and poison dart frogs. It is said that tetrodotoxin is about 1200 times deadlier than cyanide. 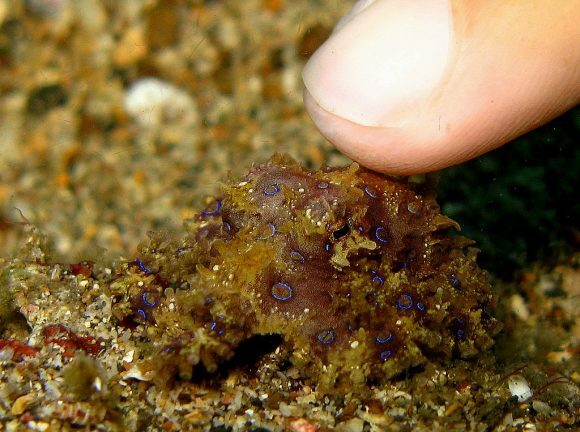 While the amount of tetrodotoxin in one single bite of blue-ringed octopus can kill up to 26 adults and there is still no known antidote to this toxin. The total paralyzing effect may result in respiratory arrest, and later to death by suffocation to the victims. Children are at the most risk because of their smaller body size, making the venom spread faster to their body. Tetrodotoxin, however, can be metabolized and excreted naturally by our body. That’s why, the only way to save the victim from death is by giving constant 24-hour CPR and let the victim’s body process the neurotoxin automatically. Usually, if the victim can survive the first 24-hour agony, it will recover. There will always be two different points of view when talking about pretty yet deadly creatures. Some of you might find this creature dangerous and avoid it. While some others might get attracted to this creature and thinking about meeting one. This is why we should give you information about the habitats of this creature. This creature is said to inhabit Indo-Pacific ocean. Blue-ringed octopus can be found in shallow water around Australia, Indonesia, Philippines, New Guinea, even some are found in Japan. Many famous diving spots in those countries include the sighting of this animal as additional attraction. However, during the animal’s indifferent state, it will be hard to be found. Like mentioned before, you will only find its infamous beauty when this animal is ready to attack. Thus, whether you are attracted to it or just want to get rid of it, anytime you see the vivid blue rings on its skin you had better be cautious. Remember that this animal is deadly venomous, and the vivid blue color only appears in its attacking state. Only foolish people want to touch this animal.